The complete history of one of the most long-lived and legendary bands in rock history, written by its official historian and publicist-a must-have chronicle for all Dead Heads, and for students of rock and the 1960s' counterculture. From 1965 to 1995, the Grateful Dead flourished as one of the most beloved, unusual, and accomplished musical entities to ever grace American culture. The creative synchronicity among Jerry Garcia, Bob Weir, Phil Lesh, Bill Kreutzmann, Mickey Hart, and Ron "Pigpen" McKernan exploded out of the artistic ferment of the early sixties' roots and folk scene, providing the soundtrack for the Dionysian revels of the counterculture. To those in the know, the Dead was an ongoing tour de force: a band whose constant commitment to exploring new realms lay at the center of a thirty-year journey through an ever-shifting array of musical, cultural, and mental landscapes. 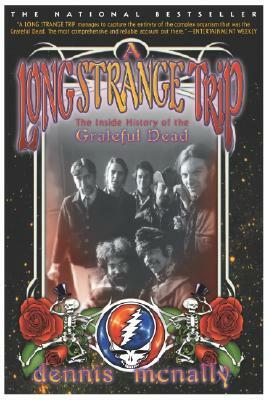 Dennis McNally, the band's historian and publicist for more than twenty years, takes readers back through the Dead's history in "A Long Strange Trip." In a kaleidoscopic narrative, McNally not only chronicles their experiences in a fascinatingly detailed fashion, but veers off into side trips on the band's intricate stage setup, the magic of the Grateful Dead concert experience, or metaphysical musings excerpted from a conversation among band members. He brings to vivid life the Dead's early days in late-sixties San Francisco-an era of astounding creativity and change that reverberates to this day. Here we see the group at its most raw and powerful, playing as the house band at Ken Kesey's acid tests, mingling with such legendary psychonauts as Neal Cassady and Owsley "Bear" Stanley, and performing the alchemical experiments, both live and in the studio, that produced some of their most searing and evocative music. But McNally carries the Dead's saga through the seventies and into the more recent years of constant touring and incessant musical exploration, which have cemented a unique bond between performers and audience, and created the business enterprise that is much more a family than a corporation. Written with the same zeal and spirit that the Grateful Dead brought to its music for more than thirty years, the book takes readers on a personal tour through the band's inner circle, highlighting its frenetic and very human faces. "A Long Strange Trip" is not only a wide-ranging cultural history, it is a definitive musical biography.